After his father’s stroke, Max Holden isn’t himself. As his long-time friend, Jillian Eldridge only wants to help, but she doesn’t know how. When Max climbs through her window one night, Jill knows she shouldn’t let him kiss her. But she can’t resist, and when they’re caught in the act by her dad, Jill swears it’ll never happen again. Because kissing Max Holden is a terrible idea. With a new baby sibling on the way, her parents fighting all the time, and her dream of culinary school suddenly up in the air, Jill starts spending more and more time with Max. And even though her father disapproves and Max still has a girlfriend, not kissing Max is easier said than done. Will Jill follow her heart, and allow their friendship to blossom into something more, or will she listen to her head and stop kissing Max Holden once and for all? 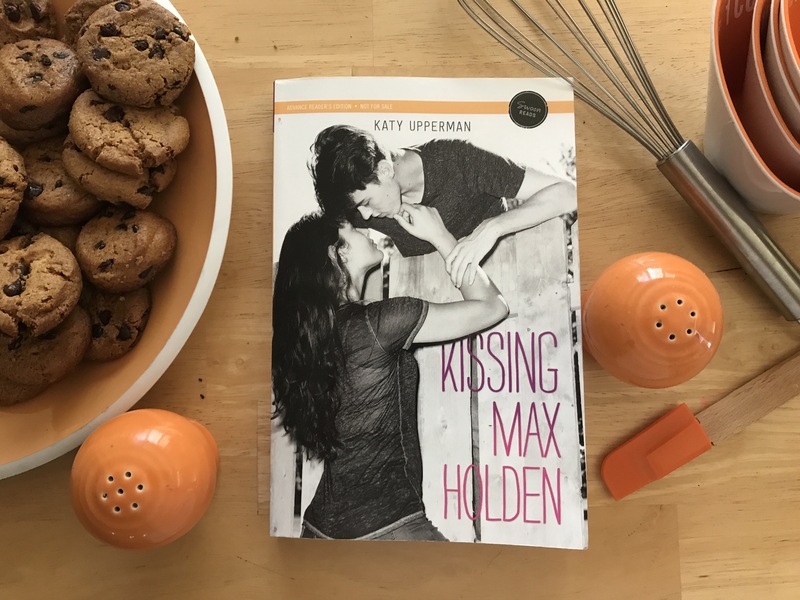 Kissing Max Holden is an amazing young adult novel that will captivate both teens and adults alike. Katy Upperman creates wonderfully flawed characters and weaves a realistic teen story that will leave readers desperate for more. One of my favorite things about this book is Katy’s writing style. Most YA books flow easily, as does this one, but in a different way. Katy writes more descriptively than most authors in her genre. While I will admit it takes a chapter or so to get used to, Jillian and Max’s story would not have been the same without it! Katy expertly weaves baking analogies into Jillian’s experiences, and writes in a way that clearly shows how intelligent Katy herself is! Her word choice is remarkable, and it’s the perfect summer read to combine a love of romance and more challenging diction than your average YA novel, which I loved! Another one of my favorite things about Kissing Max Holden was how flawed the characters were. Max didn’t always make the best decisions. Neither did Jill, her dad, or any of the other more central characters, and even though as a reader it’s infuriating (just like irl–we always want everybody to make the right decisions!) it works so well, because the characters feel so real and raw. Real people make mistakes, which this book showcased extremely well, and is one of the reasons this novel is such an amazing read. In reference to flaws….I’ll start with Max Holden, titular character. He’s not painted as Jill’s knight in shining armor (and really, she doesn’t need one), but as a real teenage boy who makes mistakes and learns from them. Of course he’s super sweet and swoon-worthy, but at times I wanted to scream at him for the things he said or did. Overall, he was a lovable (dare I say loyal?) character who was so much more than a love interest. I loved that him and Jillian had been close friends since they were children, but grew apart only to come back together. One of the reasons I like them so much as a couple is because of how strong their friendships ends up being. The fact that by kissing Jillian he’s cheating on his girlfriend, Becky, doesn’t sit well with me but it does make the book feel, as I said before, a more accurate depiction of how some teens actually act, which I know is what Katy was trying to go for! I loved Jillian as a narrator. She’s dealing with some pretty tough stuff, as is Max, but it was interesting to see how she handled it. Her baking is a huge part of her character, and as I said above I loved that Katy incorporated that throughout the novel in her descriptions. Jillian was flawed as well, even when she was trying to do the right thing. I feel like we all can relate to that. I also liked that while sometimes she helped Max, he helped her too. It was never a one-way damsel in distress situation, as can sometimes be the case in YA titles. Her close relationship with Kyle was so great and sweet, and I may or may not be totally jealous. I’d also like to officially suggest a companion novel about Kyle and that cute guy who he accepted a number from at True Brew or a book similar that. Just saying. I love stories with good, supportive friends! Ivy, Max’s sister is also multi-faceted and was caught in a tough spot between Max and Becky, which I know couldn’t of been easy. Jillian’s relationship with her step-mother, Meredith, was really nice. They had their ups and downs, but I liked how Jillian always referred to Meredith and her dad as her parents, not her dad and her step-mom. That was something that immediately stood out to me when I was reading, and I appreciated that. I also loved how close the Holden and Eldridge families were–dream neighbor relationship! Kissing Max Holden has a perfect balance of romance and familial relationships. Overall, I loved this novel, and I strongly encourage any and everyone to read it! Besides being an absolutely Swoon-worthy story, Katy tackles some tough situations, and never glamorizes or romanticized the wrongdoings of her characters. Do yourself a favor, and go preorder this book!! Kissing Max Holden will be released on August 1 by Swoon Reads ! Connect with the author! You can follow Katy Upperman on social media at @KatyUpperman!